Well, I’m back from the beach. What a trip! It was just what the doctor ordered. Since Fourth of July fell on a Wednesday, I felt like it was appropriate to keep the theme going for the whole weekend. (I do love a good theme.) Plus, when is red, white and blue not appropriate? This little vintage Chanel bag is one of my very favorite things. It used to be mom’s… until I adopted it a couple of years ago. It’s the perfect red touch to my blue and white, don’t you think? Happy Monday! It truly is a great finisher – glad you had such a lovely weekend! GREAT outfit. I love the casual/classy look, especially for the summer holidays! You look amazing! adorable! i can't seem to get enough of the red, white & blue combo either! Adore this outfit. So cute! Cute outfit, love the shirt! 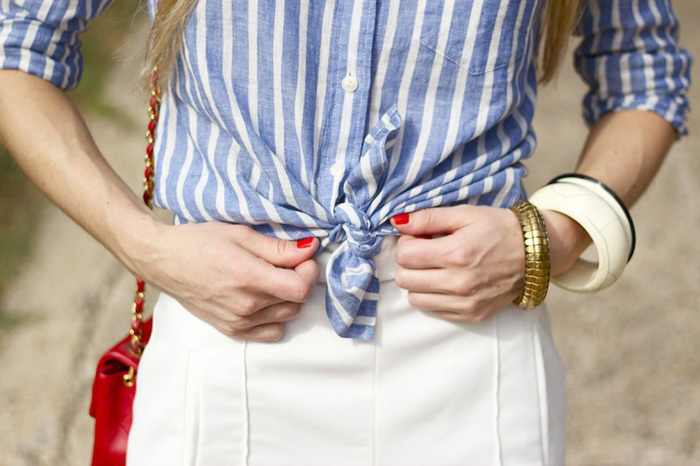 Such a fun and patriotic look. Love that sweet shirt, Bradley! This is one of my favorite outfits you have worn!! So cute on you and love the Vintage Chanel bag! This is such a cute outfit! I love the bag and your finger nail color too. You are just the cutest! Love that bag, too, plus so nice to carry your mom with you! Um, how adorable are you?! Love the pops of red! Haha, I love 'adopting' things from my mom. She doesn't love it quite as much. Love the outfit, you look like you belong in St. Tropez! ahh bradley!!! You are so cute!! wait, and I love that sally took your pictures!! ugh, just too much cuteness! LOVEEEEEE that little get up you have on!